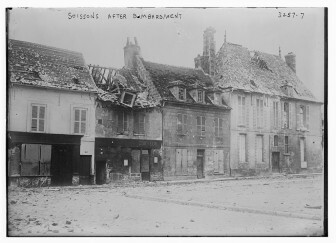 Buildings in Soissons, France after bombardment by German forces during World War I. “I have a letter from the adjutant general praising him highly for his services and for his bravery and coolness under fire,” Mrs. Clark Ross of Des Moines, Iowa, proudly proclaimed. She was talking about her 21-year-old son Pvt. Harry E. Ross. He had served with the 26th Infantry, First Division of the American Expeditionary Forces (AEF) in France during the Great War (later known as World War I). The Blue Spaders, as the 26th was nicknamed, had fought gallantly at Soissons for six days in July 1918. On July 19 Pvt. Ross, who served as a dispatch bearer, was wounded and reported as “missing in action.” Later his family believed he was discharged from military duty and sent back to the United States. That’s where Private Ross’ trail goes cold. 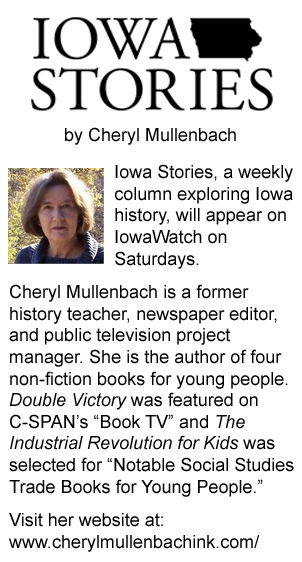 He never returned to Des Moines where his mother eagerly awaited his arrival. “He was not killed, I am sure, for several companions told me he was given first aid,” the distraught mother said. In October 1919 the Red Cross put out a call for information about the whereabouts of Ross and other soldiers who had disappeared after discharge. By that time Ross’ mother had been frantically looking for him for over a year. “I have been hunting for him vainly for 14 months. And I have questioned hundreds of soldiers and searched through many hospitals, all of whom have been asked to watch for him,” she said. Finally in December 1919 Mrs. Clark thought she had found her son. She received a telegram from Red Cross headquarters in West Virginia claiming to have served a man who fit Ross’ description. The man told the Red Cross he did not want money. He gave them his regiment and company and asked them to wire his mother—giving them Mrs. Clark’s address in Des Moines. When Red Cross personnel offered to get him a hotel room until his mother could arrive, he became frightened. He said he would come back later but left the headquarters and never returned. The Red Cross said they had no power to detain the soldier and that they could not prevent him leaving the headquarters. They said the man wore a uniform with medals on his left breast. He said he had been making his way on freight trains and that he had been in Palm Beach, Florida. “I went to the war because those whom I loved were in the war. I wished to go where they were,” Helen Hayes Gleason explained.